There is no shortage of blackberries in the Pacific Northwest, as a matter a fact, we are inundated with the invasive Himalayan blackberry. This extremely prolific but tasty "weed" is a serious problem in our open spaces, woodlands, shores, and forested areas. As much as I enjoy the flavor of blackberries, I know better than to plant this thorny pest in the garden. 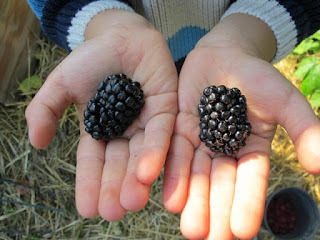 Almost a decade ago, I did some research on thornless blackberries. I knew my children, at the time 1 and 2, would appreciate picking the fruit from a thornless bramble. After a few months of research, I settled on the cultivar "Loch Ness." This is a very large fruiting blackberry that is similar to wild blackberries in flavor. One of the other advantages of this variety is that it grows upright and does not need much support. A decade later, this wonderful berry is still producing. I recommend it highly to those who have the space to host this tall yet tameable beast. It grows 6+ feet in height but not much in width. The blackberries are perfect mouthfuls of deliciousness, come by of you want a taste. We are at plot A17. These genuinely adorable pale, yellow fruits keep producing right up to frost. They are sweet and very delicious, with a light tomato taste that is very refreshing. The one-ounce fruits are larger than Sweet Million and larger than SunGold (in our garden). They require no special care but staking or caging is recommended. Note: These cherry tomatoes are not truly white but the less sun exposure they get, the lighter in color they will be. 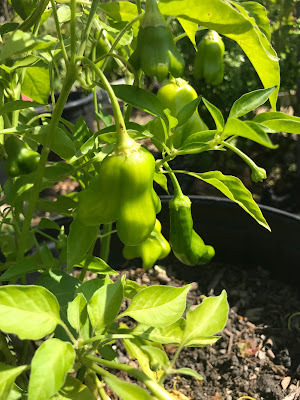 Sungold next to White Cherry.